Josh Lewenberg @JLew1050 27m RT @BlakeMurphyODC: Lowry says his finger popped out, he popped it back in, and he's got a couple days now. "It will be better by Game 1." Josh Lewenberg @JLew1050 27m RT @ekoreen: Nurse on Lowry: "He was maybe as good as I've ever seen him in this series." The Golden State Warriors' worst fears were confirmed on Tuesday. Forward DeMarcus Cousins has been diagnosed with a torn left quad following an MRI, according to The Athletic's Shams Charania, sidelining him into next season. 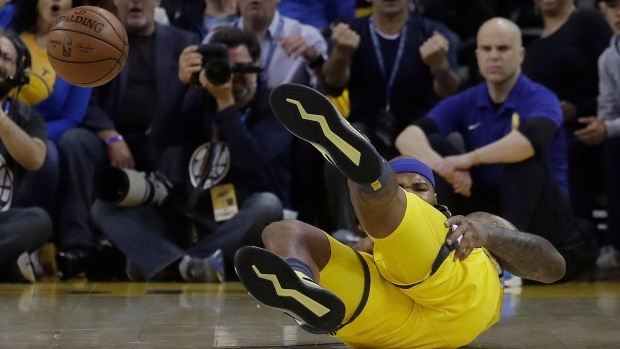 The injury occurred during the Dubs' 135-131 Game 2 loss to the Los Angeles Clippers in which the Warriors blew a 31-point lead. Midway through the first quarter, Cousins attempted to chase down a loose ball and fell to the floor. He attempted to keep going, but could not. It was only Cousins' second career playoff game in his nine NBA seasons.